**Corection Notice** - In the video, we reported a 2019 Halibut quota increase of 38%. The announcement from the Conference was the TCEY (which increased only 3.76%). February 4, 2019 - The International Pacific Halibut Commission concluded the 95th annual meeting last Friday in Victoria BC. The 2017 total allowable catch of 40.75 million pounds was adopted for a few months before reaching an agreement of 27.93 million pounds for the 2018 season. A reduction of 38 percent year-to-year followed a "more restrictive" approach across all areas from both NOAA and the Department of Fisheries and Oceans in Canada across. --- Inventory holdings are still quite high, several processors indicate holding product from even as far back as 2017 production. Pricing trends have had no particular pattern this season, hovering between $11.00 and $12.00 per pound since August for single frozen 1-3 pound deep skinned halibut fletches. --- This is considerably lower than the same time in 2017 when prices were between $14.75 and $15.25 per pound on the West Coast. Pricing this year is still indicative of too much supply in the market, and with increased supply potential from a higher quota, the market will be difficult to predict. 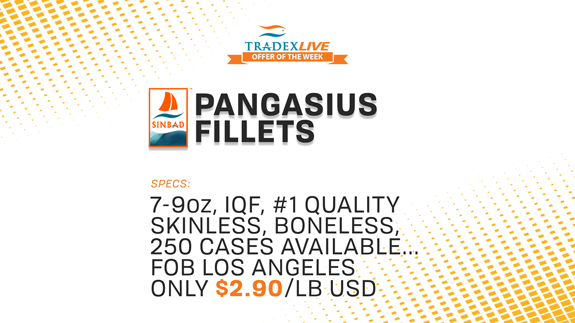 --- And Finally, our TradexLIVE offer of the week is for SINBAD 7-9oz IQF Pangasius fillets. 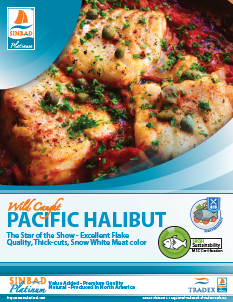 We have 250 cases available of #1 quality Swai fillets packed 1x15lb available in Los Angeles for $2.90/lb USD. 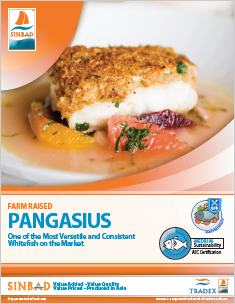 SINBAD products are harvested from sustainable fisheries (when possible) and are produced from the finest raw materials with exceptional harvesting and processing standards. All products follow our industry best 7-Step Quality Control Process delivering comprehensive inspections at every stage of processing. With our SINBAD Brand, you get a premium product, produced in Asia with our 100% Net Weight Guarantee, Accurate Piece Counts, and No Folded Bellies or Tails.